HOW TO USE: Read the Patient Information Leaflet if available from your pharmacist before you start taking donepezil and each time you get a refill. If you have any questions, ask your doctor or pharmacist. Do not remove the tablet from its pouch until you are ready to take it. Dry your hands before handling the medication. Open the pouch and peel back the foil layer. Do not push the tablet through the foil because it may get damaged. Place the dose in your mouth where it will quickly dissolve. After the tablet dissolves completely, drink a glass of water. Take this medication with or without food as directed by your doctor, usually just before bedtime. If you experience sleep problems (insomnia), talk to your doctor about switching to a morning dose. Dosage is based on your medical condition and response to treatment. To reduce your risk of side effects (such as nausea and diarrhea), your doctor will start this medication at a low dose and gradually increase your dose over weeks to months. Follow your doctor's instructions carefully. Do not increase your dose or use this drug more often than prescribed. 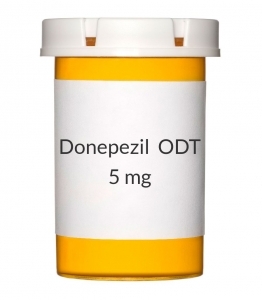 If you do not take donepezil for 7 or more days in a row, talk with your doctor before starting again. You may need to start at a lower dose. Use this medication regularly in order to get the most benefit from it. To help you remember, take it at the same time each day. Do not stop taking it unless your doctor instructs you to do so. It may take several weeks before you get the full benefit of this drug. Tell your doctor if your condition worsens.